www.sarkaritel.com - Prime Minister Narendra Modi last Thursday wielded the broom symbolically at a place where Mahatma Gandhi once stayed to launch a unique nationwide campaign that seeks to change Indians’ mindset and clean up India in five years. In a spirited speech near the India Gate monument a short while later, Modi told a huge gathering that Indians had a responsibility of fulfilling Mahatma Gandhi’s dream of ridding the country of dirt and filth by 2019, the 150th birth anniversary of Gandhi. 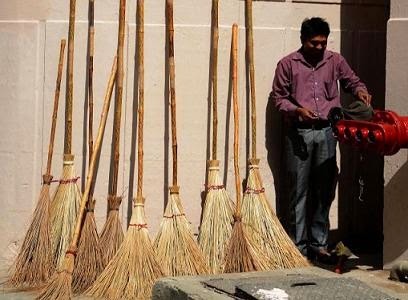 On his way to Valmiki Colony which Gandhi made his home for 214 days in 1946-47, Modi – known for his unusual workstyle – halted his car, entered the Mandir Marg police station, saw the state of cleanliness and calmly picked up the broom to sweep away the dust. After a brief visit to the Valmiki temple, the prime minister took up a broom and swept a small area in the company of party colleagues and residents to symbolically launch the Swachh Bharat Abhiyan or Clean India campaign. He used a dust pan to put the small pile of dirt into the dustbin. Modi started the day by visiting Rajghat, the Gandhi memorial on the bank of the Yamuna river. Visitors to India complain about the dirt, the absence of enough dust bins, choked drains, poor state of most public toilets, spitting and urinating in the open as well as the general lack of commitment of the people to keep the country clean. In his speech, Modi said India – a country not particularly noted for cleanliness – could be transformed provided the citizens disciplined themselves instead of expecting cleanliness only from municipal sweepers. Last Thursday marked the 145th birth anniversary of Mahatma Gandhi, who was a strong advocate of cleanliness, and on that day India Prime Minister Narendra Modi symbolically wielded the broom to launch a nationwide campaign that aims to clean up India in five years. “Do citizens have no role in this? We have to change this mindset,” Modi said in his speech. “India can do it, the people of India can do it.” Modi underlined that he should not be the focus of the Clean India campaign – and the campaign should not be viewed from a political prism. “This is not about Modi… Modi is only one of its 1.2 billion people… This is a people’s task.” The prime minister administered a pledge to the gathering to contribute at least two hours a week to keep their surroundings clean. From this humble website we congratulate the Prime Minister Modi for hearing the claims that had been done and for his decision to tackle this big problem: Trash, which affects India and especially its holy places. For several years, various spiritual teachers, individually and through their different missions, as well as private non-governmental groups have insisted that it is necessary to clean dhams not only to benefit the foreign tourists and the local community, but also for the fact that keeping these sites dirty is a great offense to the Divine. Some of the projects that are being made to clean up rivers and sacred sites in India are: Friends of Vrindavan with A Helping Hand For Vrindavan and Mayapur, and Vrindavan Cleaning Fund (VCF) program with their wonderful cleaning projects in joint operations with Vrindavan Municipality; also the Vraj Mandal Parikram and Vrinda Kunja with their projects: Cleaning Sri Mayapur Dham, Cleaning Govardhan, Cleaning Sri Vrindavan Dham, Cleaning the banks of Yamuna, Cleaning of Vamsi Vat Gardens and Gopinath Gardens; etc. Also, for months a request to the Prime Minister of India to clean India is provided in the web. (Editor's note). This is a request to the Prime Minister of India: Narendra Modi, to clean India as a good strategy in order to increase and improve tourism. Every year, ancient culture and sites (such as temples and palaces) all over India, attract many tourists to the country. However, there is a big problem which makes people reconsider returning to India: trash. Trash everywhere, on the roads, streets, bus stations, outside the temples, stores, and even restaurants, etc. represents an unpleasant experience for having a mystic dream. This is not only dangerous for the health of tourists, but also for all the local residents. It is urgent to clean India and create a permanent cleaning culture. A clean India is something not only tourism deserves, but also Indians. Surely, this action will improve both the economy of this country by attracting more tourists every year and also will reduce the mortality and disease rate due to infections.